I’ve been CRAZY busy over here working on crafts for a big craft sale. I’ve been participating in this craft sale the past couple of years. It’s a lot of fun and can be financially profitable but it does require a lot of time and work. So, as you may have noticed, I’ve been giving my time to this craft show instead of my blog lately. But, I’m back now and plan to share a variety of the items I made over the next few weeks. This first one is my most colorful project and the one that I love the saying the most!! 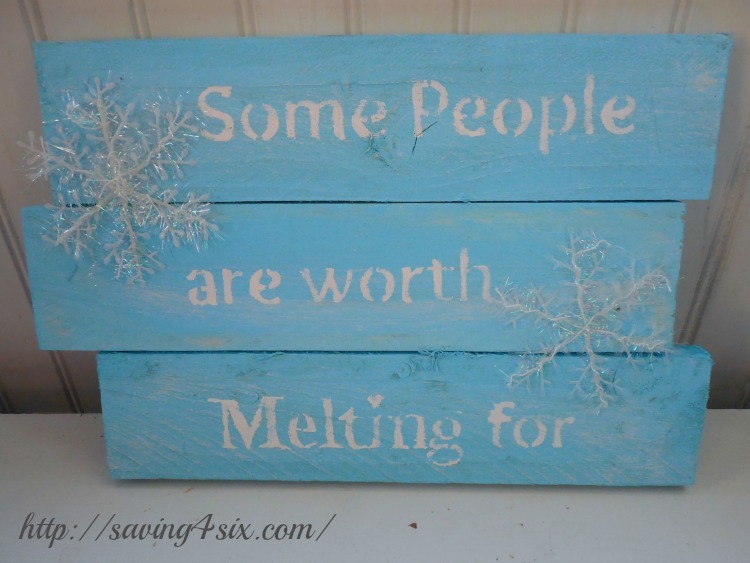 There are really a few people that are worth melting for…I LOVE those kind of people!! And you know, I of course love everything Frozen!! My Better half cut out 3 – 12 inch pieces of pallet wood. These are rough sawn ones but you could use whatever you have. I painted them a pale blue and then used a stencil to add the words. Ok, so for me, this is the time consuming part. I don’t have one of those fancy cutting machines…like the Silhouette Cameo , so I have to cut out my stencils by hand…the old fashioned way!! Here’s how I do it: I print the above picture on card stock. Then I lay the words on a cutting board and use an X-Acto knife to cut out the letters…being careful to leave the center of letters like e, g, o and others attached. Then I place the stencil on my wood and paint the letters. I use a round foam brush that only has a tiny bit of paint on it (almost dry brushing). My Better Half attached the three pieces of wood together (from behind) with two smaller pieces of wood, running vertically. He then attached a hanger for hanging it on the wall. I found the snowflake decals at the Dollar Tree… 6 for $1, and attached a couple with a hot glue gun. I think these are SUPER cute and cost me under $1 to make. 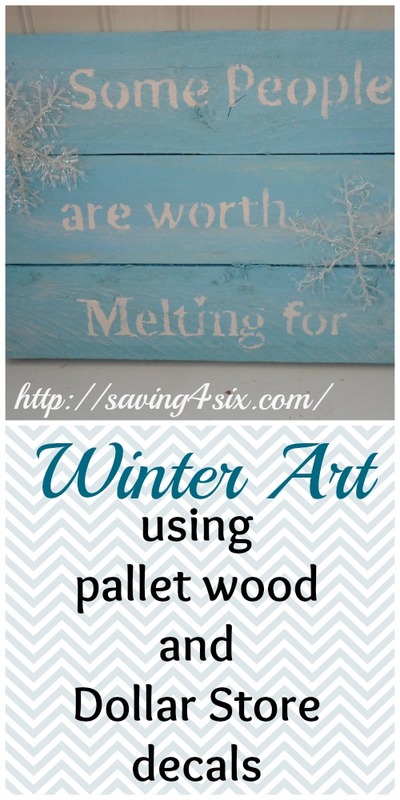 With free pallet wood and inexpensive supplies, these would make a great gift for all your friends that are worth melting for!! find the perfect travel companion for you, though. The seekers can easily experience some personal conversation readings after checking every thing in the trial.